Microsoft's much-heralded Windows 7 went on sale around the world Thursday as the US software giant seeks to reboot after the disappointment of its previous generation operating system Vista. Windows 7 made its global debut to generally good reviews with most technology analysts and users who tested a demo version praising it as a significant improvement on the much-maligned Vista. "We think our customers will enjoy the new capabilities, the speed, the performance," Microsoft chief executive Steve Ballmer said at a Windows 7 launch event in New York. "There's more you can do with this system. "The range and diversity of the application software is unsurpassed." By the time the day was a minute old, Microsoft workers were handing out Windows 7 software as gifts at a party the US technology giant held at a San Francisco night club to coincide with a Web 2.0 Summit. "Now we see if real people love Windows," said Brian Hall, general manager of Microsoft's Windows Live business group. Feedback from the millions of test users has Microsoft confident they have hit the mark with the new-generation operating system, which reportedly logged more pre-orders in Britain than the final Harry Potter book. "This is the most customer excitement we've had in a long time for a Windows release," Hall said. Microsoft is also celebrating the availability of Windows 7 with parties and by opening its first retail shop, in the US city of Scottsdale, Arizona. The shop features netbooks, laptops, desktop computers, Zune players, Xbox 360 videogame consoles, and mobile phones running on Microsoft software. A second Microsoft store will open in northern California next week. Microsoft on Thursday also began selling Windows-powered PCs from companies such as Sony, Dell, and Lenovo in its online store. Microsoft hired David Porter, a retail industry veteran, in February to open retail stores that challenge the successful chain of Apple Stores operated by the maker of iPhones, iPods, and Macintosh computers. The launch of Windows 7 is expected to open the flood gates for low-priced, feature-rich personal computers based on the operating system. "We have great PCs coming out for Windows 7," Hall said. NPD analyst Stephen Baker told of visiting a major US consumer electronics shop the weekend prior to the launch to find Vista-based computers were not to be found and shelves were stocked with Windows 7 machines. "Someone did a great job in the supply chain making this happen," Baker said in a blog post. "This will give Windows 7 a tremendous boost out of the gate." An upgrade from Vista or the previous operating system Windows XP to the most basic version of Windows 7 costs 120 dollars in the United States. 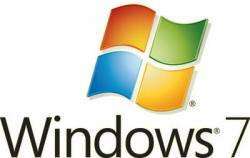 Analyst Rob Enderle of Silicon Valley's Enderle Group said the Windows 7 launch is a "big deal for Microsoft. "Windows Vista was a train wreck," he said. While computer users may not give much thought to the operating systems that serve as the brains of their machines, they are at the heart of Microsoft's global software empire that runs more than 90 percent of the world's computers. Among the new features in Windows 7 is a redesigned taskbar for launching programs and switching windows, enhanced ability to share files with other PCs, improved photo and video editing software and the ability to stream digital music or video to other devices. Windows 7 also features Microsoft's latest Web browser, Internet Explorer 8. "It's a fun day to work in Windows," Ali Parker of Microsoft's Windows team said while providing operating system tips to people trying the software in a Bing lounge at the Web 2.0 Summit. "It's been a long time since we got this positive feedback. Even Mac users are talking about going home this weekend to run Windows 7 in parallel on their computers." Microsoft shares gained 0.04 percent on Wall Street on Thursday to close at 26.59 dollars. "Microsoft's much-heralded Windows 7 operating system made its global debut on Thursday." Aren't all of them "much heralded". I'll wait and see. That seems to be the best advice when MickeyMouseSoft is the topic. I have to say that comparing Disney's Mickey Mouse to Microsoft is a huge insult to Disney. When Disney does something they usually do it right.